Want to know what your bike is worth? Want to know what you should be paying for your next bike? Until now the best way of making an informed judgement was going through MCN’s classified ads with a fine-toothed comb and compiling the nuggets of information you need. But now Parker's is doing that for you – and mixing in every other relevant factor in the market to give you the most definitive bike pricing guide yet. Sell your bike CLICK HERE MCN’s stablemate Parker’s is offering the service FREE. All you have to do is CLICK here and make a few short selections. Parker's – already an acknowledged expert in car pricing, is now compiling a comprehensive range of bike prices based on what bikes actually sell for. For the first time it offers an independent, accurate guide to bike values both sellers and buyers can refer to. "The problem has always been that nobody really knew what a bike was worth," reveals Kieren Puffett, Parker's editor. "Bike values have been based on guess work and what sellers and dealers think they can charge for rather than what they are worth." 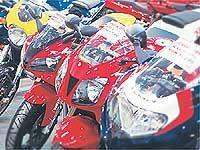 Given the large number of secondhand bikes available there is a big chance you could end up paying over the odds. Parker's checks 250,000 bike sales a year to reveal exactly what prices bikes are actually sold for. "Parker's prices are based on what you should expect to pay after an easily negotiable discount," explains Kieren. CLICK HERE TO CHECK PRICES NOW FREE!